interested, don't hessitate and visit! I've been to this site before, I'm uncertain if someone gave me the link or if I found it on my own. It's a pretty cool site and I think everyone should go to at least once just to look at the pictures. IMHO, the lacrimal is remniscient of Byronosaurus. I saw that the first time I was there, that is kind of odd. 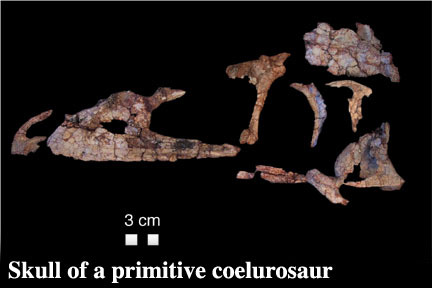 Does anyone know why 'Protoavis' would be considered a basal coelurosaur? wondered: Who was General Tso of "General Tso's chicken" fame? "Do you need adventure in your life? Do you need excitement? Well then, stop herding those alpaca and start herding these, that's right, for the low, low price of $50 dollars a month, you too can herd cats, why it's all the latest craze these days and if you start today, you can..."
Next by thread: Some of my dinosaur sculptures.